One of the key features that sets Northwest Florida Spine apart from other clinics that treat back and neck pain is its emphasis on spine-specialized physical therapy. Patients will be connected with a spine therapist who has advanced training in specialized spine therapy techniques. The Northwest Florida Spine affiliated spine-trained therapists have skills and techniques that are specifically oriented at relieving back and neck pain. The only way to permanently relieve pain involves changing the physiology of the back by using exercise to make it stronger, more flexible and resistant to injury. While a general physical therapist may spend weeks attempting to mask pain using heat, ice or ultrasound, research has shown that using these passive “feel-good” treatments does not provide any lasting benefit. That is why most health insurance companies no longer pay for feel-good, passive treatments involving heat or ice. They believe you can do this on your own at home. Spine is a special problem requiring special training. The general physical therapist often sees a wide variety of patients each day who suffer problems related to sore elbows, knees or shoulders. While general physical therapists are very strong with many sports medicine ailments, they typically have a very limited understanding of the best ways to treat specific types of back problems. At best, they may have taken a couple courses on therapy for a back or neck injury. Spine care can be complex, and it requires extensive training to address the variety of problems seen in a spine center like Northwest Florida Spine. For example, a spine-specialized therapist’s primary goal is to enable the patient to perform a customized home exercise program as early as their first visit. The therapist’s second goal is to make the patient independent of therapy within a short period of time. Instead of receiving a general treatment approach, a spine therapist specializes in treating back and neck pain. These therapists have advanced, hands-on skills that can help relieve your pain and get your injured muscles, tissues and spinal structures moving again. Instead of a single school of thought, patients can access specialists with a variety of skills who can match the best treatments to your particular problem. Manual therapy relates to the use of a therapist’s hands to achieve pain relief. By using specific techniques, the spine therapist can relieve pain through hands-on movements applied to vertebrae and soft tissue areas. This is achieved not passively, with a modality such as ice or heat, but through actively moving the joints and tissues. Spine-specialized therapy can involve techniques taught by schools including McKenzie, Paris, Ola Grimsby, Cyriax and the Maitland therapy school in Australia. A manual therapist’s background typically begins with physical therapy training, followed by advanced education in spine that sets them apart from general physical therapists. This specialized education can be within a host of manual therapy philosophies, each involving unique pain-relieving techniques that help patients return to function as quickly as possible. Regardless of the particular school of thought, the best spine therapists avoid the use of passive modalities, which do not provide permanent relief. Q. What makes spine physical therapy different? A. Just as the trend in medicine is for physicians to subspecialize in knees, or arm, or joint replacement, the exact same thing is happening in the area of physical therapy. That’s good news for patients. Just as the first step for a physician is to receive his MD degree, the first step for a physical therapist is to become a licensed physical therapist. Most spine centers and therapy clinics will have licensed physical therapists who split their time among patients with knee pain, hip problems, shoulder pain, hand problems, ankle problems and foot problems. Experts have found, however, that back and neck problems can be stubborn to treat and may not respond to general techniques learned in therapy school. Worse, what often happens is that when generalized therapy fails to relieve symptoms, the patient has to resort to spine surgery. Consequently, those therapists who spend 100% of their time with spine patients learn early on that they need advanced training to help patients recover from back and neck pain without spine surgery. The better the spine training, the more often the back or neck pain sufferer will be able to recover without having to resort to spine surgery. Q. What is the McKenzie Method? A. The McKenzie Method was developed about 40 years ago by a New Zealand therapist who observed that back and neck pain symptoms could be relieved through special stretches and movements. Over the years, the technique has evolved to include a systemized approach designed to help many people with back and neck pain symptoms recover without the need for surgery. Therapists who want to learn the McKenzie Method attend special courses and take a credentialing exam that documents they are proficient in these special techniques. If they pass a series of rigorous exams that include Parts A, B, C, D and E, they become McKenzie-certified therapists, and can put the initials “MDT” after their name. The McKenzie Method (also known as Mechanical Diagnosis and Treatment or MDT) enables the McKenzie-trained spine therapist to use a “system” of evaluations and movements with the patient. Through this approach, the McKenzie therapist can assess how the patient’s symptoms respond to various movements or sustained positions. If a certain movement relieves pain, this provides information to the therapist about the disc or soft tissue injury, which in turn influences the recommended therapy treatment. Said another way, the therapist helps the patient discover what specific movements begin to relieve pain, and then use additional, complementary stretches that encourage healing and relief of symptoms. Q. What will spine physical therapy be like? A. At other clinics with general therapists, you may have laid on a table, while someone put hot packs or ice on your back. Or your therapy may have included other passive things like ultrasound. Or you may have had a massage. The insurance companies who pay for back care have done extensive research on things that relieve back pain — for the long term — and they now have policies that eliminate payment to clinics doing “palliative care.” The word “palliative” means something that feels good, but doesn’t cure anything. So while a massage or hot pack may feel good, it doesn’t provide any lasting change to the soft tissues in your back or neck. The effect on your symptoms is temporary, and in a sense, worthless because it doesn’t last, and your pain will return. Nationally, the best spine treatment clinics avoid passive things like hot packs, ice and massage. Instead, spine specialized clinics emphasize things that strengthen the back, make it more flexible and resistant to injury. In other words, Northwest Florida Spine affiliated spine physical therapists emphasize specialized spine techniques, stretches and exercises that will help you recover from injury without having to resort to surgery. At the foundation of spine therapy, for example, is the philosophy of helping the patient to take responsibility for their own health. We will show you the special exercises that are customized for you. By using this customized series of stretches, you have the resources you need back at home to control your back or neck pain symptoms long term. Q. How do McKenzie exercises work? A. McKenzie exercises are based on Directional Preference. We help each patient to discover a direction or movement that improves mobility or function to relieve symptoms. This might be an extension movement, flexion of the trunk, rotation of the trunk, retraction or some combination of movements. Once a directional preference is found, then to we have to discover the optimal load and effort required to achieve the best results. Q. Will my leg or arm pain go away using this method or will I need surgery? A. The second aspect of the McKenzie Method involves the concept of “centralization” of pain. Using these McKenzie techniques, a therapist can help a patient that has pain radiating down a leg to the knee area, to reduce the pain symptom so it no longer goes as far down the leg, and over time shrinks and “centralizes” the pain until it eventually disappears. Some patients with pain radiating from the neck into the arm, and from the back into the leg, can respond very well to these exercises and stretches that centralize and ultimately relieve the pain completely. 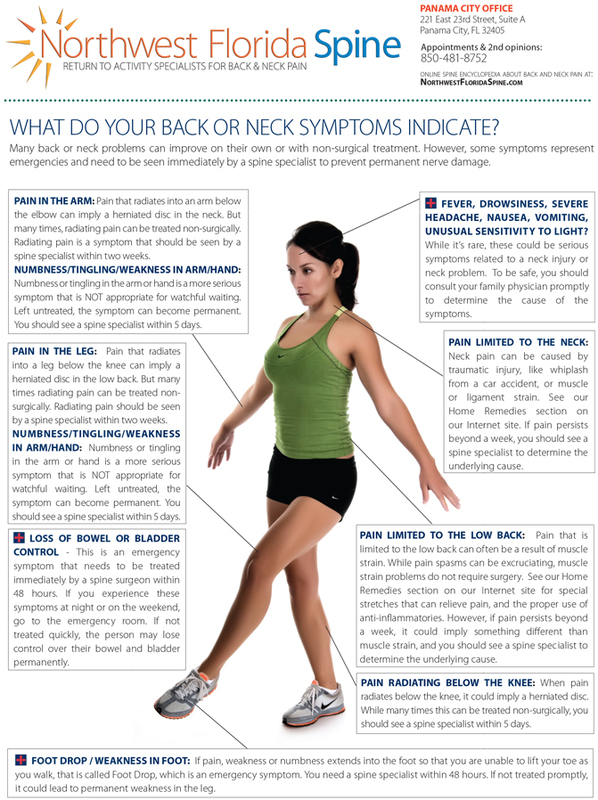 It is important to note, however, that any time you have symptoms that involve radiating pain or numbness into a leg or arm, consider these serious emergency symptoms that need to be seen by a spine surgeon or spine physiatrist to determine if they are worsening, or if they can be managed with therapy. If you ignore these symptoms, such symptoms can cause permanent nerve damage. Another emergency symptom is any loss of control or bowel or bladder.